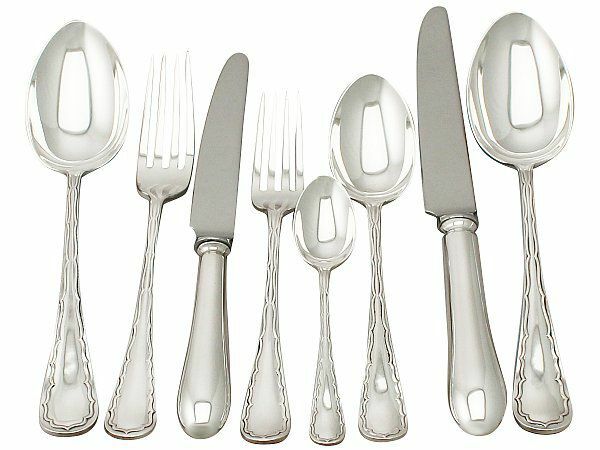 The pieces of this exceptional antique Edwardian sterling silver straight* flatware service for ten persons have been crafted in the Old English shape. The surface of each handle is embellished with a paralleling Chippendale style incurved border. 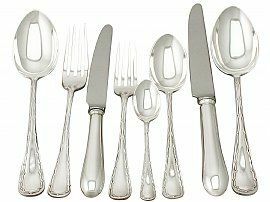 The fundamental pieces of this silver cutlery set have been crafted by the Sheffield silversmith Joseph Ridge of John Round & Son Ltd in 1907, apart from the table and dessert knives, which are replacements**. The Old English Candle style knives have been crafted to compliment the service. The reverse of each spoon and fork bears the registration number 'Rd 475537'. This antique flatware service is supplied in felt cutlery rolls; which not only protect the items in storage but significantly reduce tarnishing. ** ** Predominately all antique silver canteens have replacement knives as the originals have not stood the test of time. This antique flatware service is an exceptional gauge of silver, exceptional quality and in exceptional presentation condition.